These ‘then & now’ fades*, comparing today’s satellite images with an OS map from 1888, show how the Goyt Valley has changed since the construction of the twin reservoirs. Click the ‘Then’ and ‘Now’ buttons to fade between the two views. Or simply drag the green slider button. For more information on places keyed on the maps, simply click on any link. The maps run from Taxal in the north down to Goyt’s Moss in the south. The maps are remarkably accurate – and a testament to the skills of Victorian cartographers. Click here to read where the images came from. *Can’t see the fades? They’re created using software called ‘Flash’. Unfortunately it doesn’t work on all devices – particularly smart phones and tablets. So if you can’t see these examples, this will probably be the reason. But if you’re viewing on a laptop or desktop and still can’t see them, you may need to click a link saying ‘Enable Flash’. Or check your browser security settings. Click here for more advice. Above: These two images – an 1888 OS map and today’s satellite photo – come from a wonderful website created by the National Library of Scotland. On the left is the hamlet of Goyt’s Bridge. And on the right is a satellite photo showing the scene today – the southern tip of Errwood Reservoir. The most noticeable feature of the landscape to survive is the curved wall on the far right. 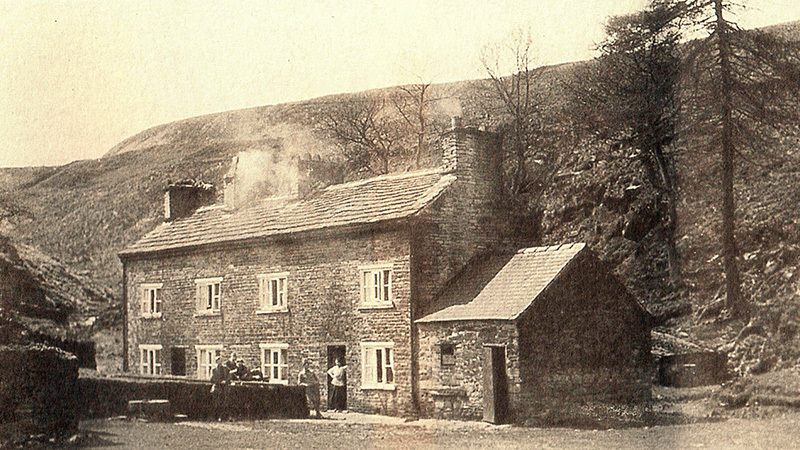 This is easy to spot from Errwood Hall car park – on the opposite side of the reservoir. 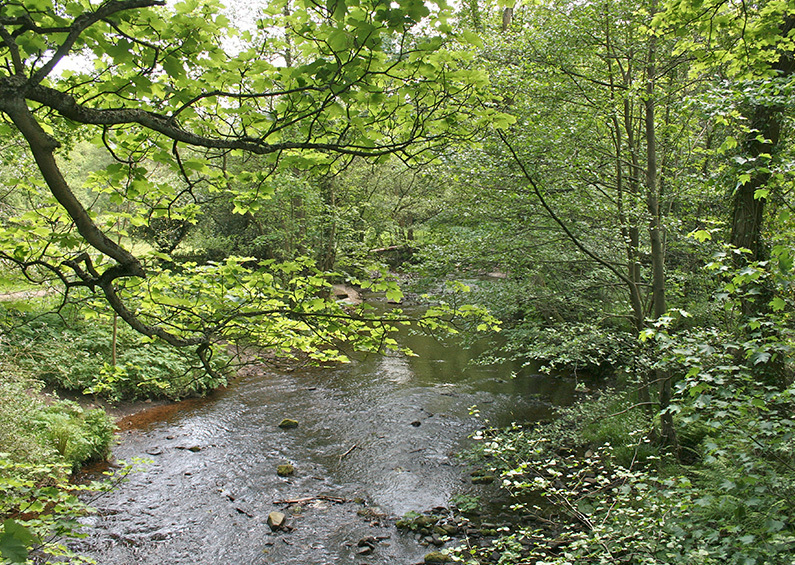 Above: An ancient packhorse bridge once spanned the Goyt beside the ford at Taxal. A flood washed it away some years ago and it was replaced with a narrow wooden footbridge. But the view is always wonderful. 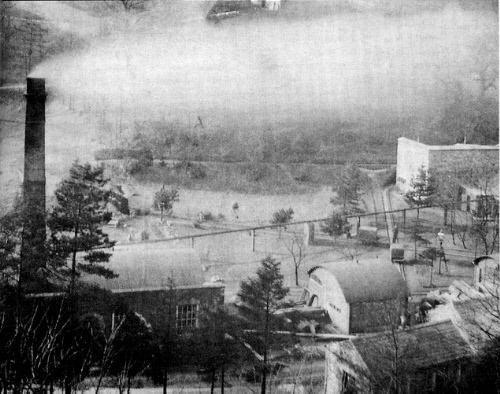 Above: I think this is the lodge marked at 9 (click to enlarge). But I’m not 100% sure. Click here for more about this photo. Above: (Click top enlarge.) Fernilee Gunpowder Mill (11) closed in 1920 and now lies beneath the northern end of Fernilee Reservoir. There’s lots of information about the factory on this website. Above: (Click to enlarge.) 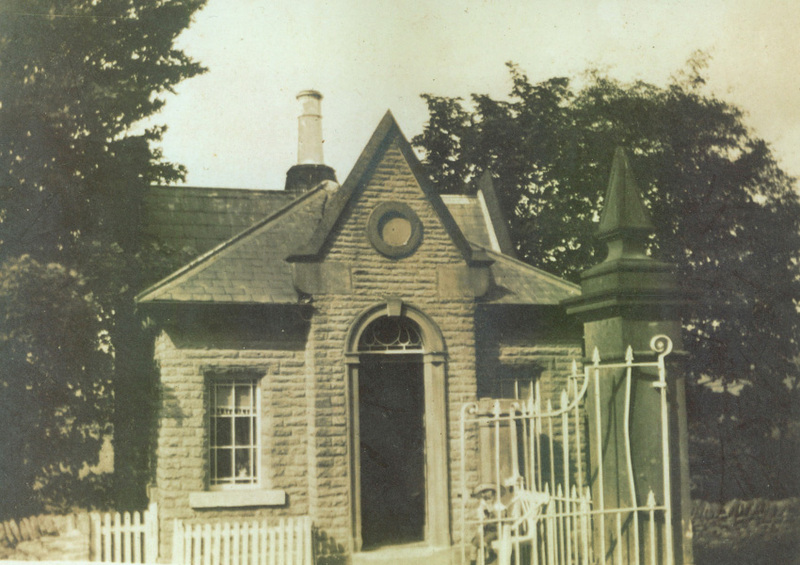 Marked ‘Errwood Cottage’ on the 1888 map (23), this attractive house was known locally as ‘Gatehouse & Gardener’s Cottage‘. Above: (Click to enlarge.) 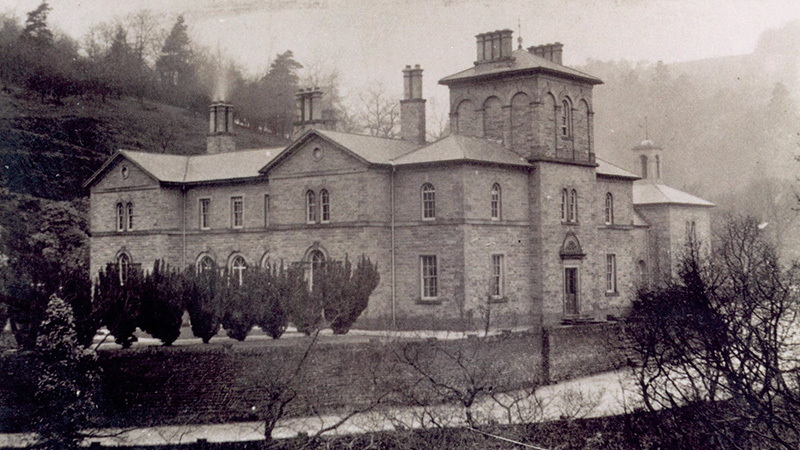 Home to the Grimshawe family, Errwood Hall (28) was built in the 1840s but lasted less than 100 years. The ruins are a popular spot for visitors. Above: (Click to enlarge.) 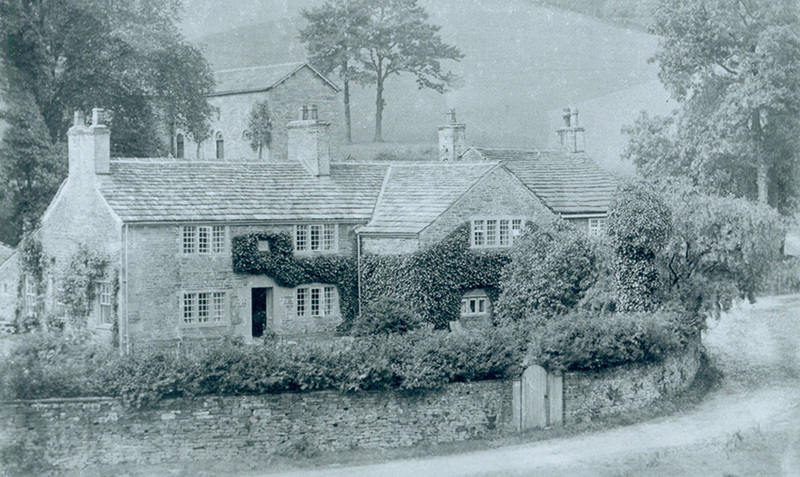 The Paint Mill Cottages at Goytsclough (34) were demolished in the 1930s. There are few signs left of the building, or the nearby mill and stone quarry. Above: (Click to enlarge.) 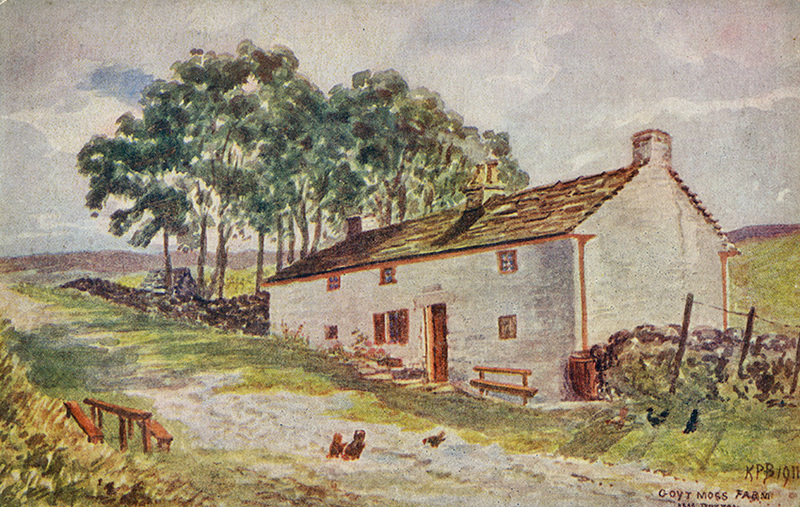 Goyt’s Moss Farm (40) was one of four houses on this windswept section of the Old Macclesfield Road, close to the Cat & Fiddle Inn.